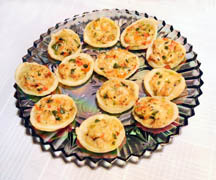 This makes an easy and delightful appetizer or canape -- excellent when paired with tea or something stronger! Sauté veggies till tender. Add chicken and enough dressing to moisten; heat through. Line pastry cups with pie crust or cream cheese pastry. Top each with sprinkle of Swiss cheese. Bake 10 minutes at 375 degrees. Makes 16 to 20 servings. This recipe, and others posted on the blog, will be included in a forthcoming ebook called SIMPLY GOOD: Recipes for the Busy Cook.